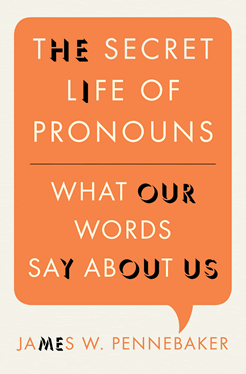 This here book is The Secret Life of Pronouns, a fascinating and in-depth study into language. It looks at language of love, lying, personality and – yes – status. The surprising conclusion is that the most important words in determining these things are the words we don’t think about: personal pronouns (I, you, we) and other function words (there, that, on, under, the, a…). The book also says that although we can look at the language of high status people and see the patterns, that doesn’t mean we can adopt that language style and become high status ourselves. Despite this, several “pickup” gurus have advocated this, based on this very book. They’ve clearly ignored the bit where James Pennebaker stresses that the words are the symptom of high-status, not the cause. So can an AFC simply say “I” less and become high status? No. No he can’t. This belief system is an unfortunate hangover from the NLP craze, and the fanatics out there who think that if you can control your representation systems and self-images you can change your interactions in the real world. But seeing yourself in a certain way is much more a symptom of being that way. For example, in areas I see myself confident when I picture it (such as street approaching), I became confident in those areas before I saw myself as such when visualizing it. I tried to do it the other way for a long time, and I can say that visualizing the success did help, but it’s no substitute for doing the actual thing. So I’m not saying that NLP is useless of course, but it has limits, and many proponents often get it arse-backwards. The same is sometimes true of so-called “pick-up” techniques, even the vague ones like “push-pull”, “cat-string theory”, etc. 1. They start “sarging”, and with dedicated practice over a long time, they get really really good. Unconsciously competent good. 2. They look with consciousness at what they are doing it and label it something, like push-pull. 3. Then they say to the AFCs – “see, you need to do push-pull, then you’ll get to where I am”. But push-pull comes naturally as a by-product of training, becoming relaxed and free of the outcome, and slowly learning to enjoy the process through repetition. Now I’m not saying that being aware that the person you are modelling is using “push-pull” is a bad thing – on the contrary, it’s a very good thing. And when you are aware you start to notice when you’re doing it naturally and you bring more awareness to it, it becomes enhanced. But look at the difference between that and saying “I’ll do push-pull, even though it’s not congruent, then it will become congruent.” This is the wrong way to look at this. And by wrong I mean less effective, and more likely to cause you to end up resenting having to be someone you’re not. I very much suspect that this is the primary cause of the “PUA hate” phenomenon. The haters are despondent and deeply frustrated that the promise of “copy my symptoms and you’ll have my unconscious skillset” did not come true. On the one hand you can blame the haters for gullible credulity in believing in the quick fix and paying a lot for it, but some of the credit for this hate-filled discord must surely go to the industry and the PUAs who sell what they must know is a lie. It’s like looking at an athlete and saying “what I need to do to get that skillset is find out how he sees himself, how he pictures and what he pictures when he’s performing.” No my friend, what you need to do is train. Train like hell. Training like hell will lead you to those pictures and self-images. They are the symptom of someone who has trained like hell. The solution? Forget the outcome, forget the push-pull. How? You concentrate on yourself, on knowing and finding yourself. How do you do this? Follow the rule of Nike: Just Do It. Explore, question, approach, think, feel – in other words be a curious human being and act on those curiosities. After this the outcome doesn’t matter naturally, you push-pull naturally and you will have more success that lasts, because you’ve done a great deal of work developing yourself. This is why I work with students on the practical aspects. I also give some techniques but they are really a bunch of red-herrings. I am just distracting their minds while I give them the experience of Just Do It, without rationalising their way out of it or over-thinking. It’s like the rice in the pot. Should I do this? Should I do that?